Are you preparing for Coding Interviews? If yes then you might know that there are a number of free online resources to practice important topics for coding Interviews e.g. data structure and algorithms, database and SQL, and others. These websites are equally useful for both, new programmers who are just learning the fundamentals and for experienced ones who are brushing up their coding skills for interviews. I have been sharing useful resources for programming and technical interviews from a long time in this book. In past, I have shared some recommended books for coding interviews and some of the frequently asked programming interview questions from tech companies (see here). But, my readers have been asking about some recommended websites for practicing programming challenges and coding interview questions. So, in this article, I am going to share some of the best websites which will help you to practice Coding Interview questions for free. Some of them also have their paid version and a couple of them are also used by companies for screening candidates so you will get the first-hand experience of what to expect on real coding interview. Thes websites are not just useful for anyone who is preparing for coding interview, but also to any programmer who seriously wants to improve their coding skill, which is the most important skill for a programmer. These websites will help you to improve both your coding sense and problem-solving skills. Alternatively, If you like books, you can also see this list of books to improve your coding skill. Programming interviews have always criticized for its theoretical nature i.e. anyone who knows a little bit of coding can get a job by just mugging some of the frequently asked coding interviews, e.g. anagram, string permutations, or linked list questions, but that is now the thing of past. Just like to get a driving license, you need to pass both a theoretical test and a practical drive, many companies are now moving to a similar model where they will test both your theoretical knowledge and practical coding skills before they offer you a job. This growing trend has made these resources even more sought after. I am a member of all of the websites I have shared here, solved a couple of problems and still go there whenever I have some free time, particularly the LeetCode. Here is my list of some of the best websites which will help you to prepare for coding interviews. They are free and contains a lot of questions and offer different kind of experiences. There are many others but I feel these five is more than enough. If you can even solve all the problems in the first websites you have a very good chance of doing well on any coding interview. LeetCode is a platform for preparing technical coding interviews. Pick from an expanding library of more than 450 questions, code and submit your solution to see if you have solved it correctly. It is that easy! You will find all kinds of different interview questions divided into four major categories e.g. Algorithms, Database, and Shell Scripts. The Algorithms contains interview questions on the array, linked list, string, binary tree, graph and others. The Database section contains SQL query based problems e.g. write SQL query to find second highest salary or Nth highest salary etc. The HackerRank Community is one of the largest learning and competition community for programmers. HackerRank for Work is the leading end-to-end technical recruiting platform for hiring engineers. HackerRank is also very addictive, once you start, you will likely spend hours solving coding problems. More than 1 Million programmers are part of HackerRank which speaks volumes about the value it provides to programmers who want to prepare for coding interviews and improve their coding and problem-solving skills. Many tech companies also uses HackerRank for arranging screening and written test for candidates. CodeFighting is the best way to hone your programming skills by challenging friends and other programmers to head-to-head battles. When you create your account you will choose the programming language you’d like to use on CodeFights and then you will have your first fight with a robot, interesting, isn't it? The CodeFights website tests how well can you code? It tests your skills against friends, co-workers, and companies. Some tech company also use services of this website for screening candidates based on their coding skills. The Interview Cake claims to teach you the right way of thinking to break down tricky algorithmic coding interview questions you've never seen before, something you will be likely asked in tech giants like Microsoft, Amazon, and Google. No prior computer science training necessary—I'll get you up to speed quickly, skipping all the overly academic stuff. The Pramp is another good website which allows you to practice coding interviews for free. Join thousands of developers who already use Pramp to ace their coding interviews. I really like their unique style which allows you to practice coding Interviews in pairs. Just tell when and what you want to practice and they'll pair you with an optimal peer. They provide interview questions (and answers) which both of you will use to interview each other. Coding interviews are live video sessions with a collaborative code editor. You and your peer interview one another for 30 minutes each. After the interview, you both rate the other's performance. This is seriously good because it gives you chance to learn from peers’ feedback, gain confidence and master the art of interviewing. Keep practicing until you interview like a rock star. Impress recruiters and land awesome job offers. That's all about some of the best websites to prepare coding, or programming or technical interviews for development and support Jobs. 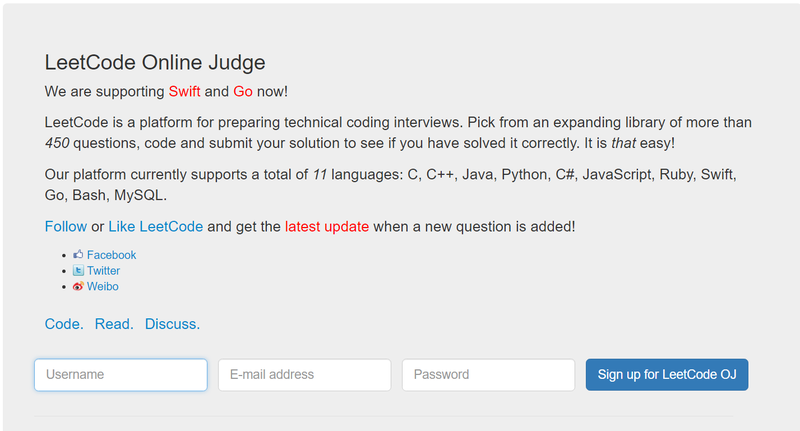 CodeFights is like HackerRank and also used by some companies for screening candidates before face-to-face interviews. Interview Cake is a freemium service for practicing data structures and algorithms through self-study. It will send you daily emails posing a challenge for you to code, solve, and submit the solution. Pramp is a free service for practicing technical interviews by pairing up engineers who interview one another online. These websites will not only help you to perform better on a real interview but they will also help you to become a better programmer by improving your coding skill and think through ability. Even if you are not preparing for coding interview, you can use these websites to check your coding skills and improve them. Thank you for reading this article, if you like this article, please share in your friend circle and with your colleagues. If you have any suggestion, feedback or if you want to share your interview experience, just drop a comment. @Anonymous and @Sawan indeed, codewars and codechef both are great website full of challenging problems to really test your coding skills.